The minister called Clooney the "quintessence of an American actor"
Hollywood star George Clooney has been honoured by the French government for his achievements in cinema. The Ocean's Thirteen star was presented with the Chevalier des Arts et Lettres medal at the Deauville American Film Festival over the weekend. French Culture Minister Christine Albanel praised Clooney's "limitless talent" and "irresistible charm". 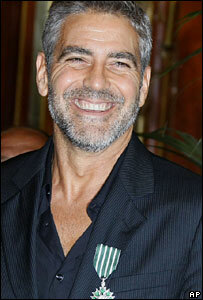 Clooney joins US stars Brad Pitt and Matt Damon at the festival, which is showing his new film Michael Clayton. It follows the thriller's world premiere at Venice Film Festival last week. Clooney, who rose to fame in the long-running TV drama ER, won the best supporting actor Oscar in 2006 for Syriana. In his latest film, he plays a "fixer" for a New York law firm, who faces a moral dilemma when he is asked to clean up some corporate dirty dealings. 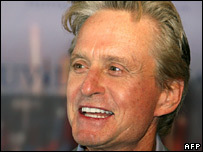 Hollywood star Michael Douglas opened the festival in the coastal town of Deauville on Friday. Lionel Chouchan, the founder of the festival - now in its 33rd year - gave the star an affectionate welcome. "I have a love affair with the Douglas family," said Mr Chouchan. "It's an old flame and I apologise for such a late coming out." "Everyone can say that a festival is special, but not everyone can say that a festival changed his life," countered Douglas, who met his second wife, Catherine Zeta Jones, at the event nine years ago. The festival paid tribute to the actor, best known for films such as Wall Street and Fatal Attraction, before opening with a screening of his latest comedy, King of California. The event runs until 9 September, and includes a tribute to veteran director Sidney Lumet and the world premiere of his new film, Before the Devil Knows You're Dead.